What Are The Best Credit Cards For Non-Travelers? I wanted to write a post for the people out there who don’t travel or simply don’t like traveling. I know for me, traveling causes more headaches than its worth. I would much rather be in the comfort of my own home where I have everything setup exactly the way I like. What are the best credit cards for people in my situation? I will cover some good general use cards as well as category specific cards like restaurants or groceries. 1. The best credit card for non-travelers in 2015 in my opinion is the Sallie Mae Mastercard. This card gives a whopping 5% cash back on gas and groceries up to $250 per month AND 5% back at Amazon.com. That 5% cashback is simply put, AMAZING. To earn the same cash back amount as the Sallie Mae on the next best card, the Citi Double Cash, you would have to spend $1250 compared to $500 on the Sallie Mae. The best part is that the bonus category are good categories that everyone spends money on each and every month AND they never change. I know I will be grocery shopping and using gas for the foreseeable future. I also do a lot of shopping at Amazon.com because they have the lowest prices on a wide variety of items. What I used to buy at Walmart or Target has shifted to Amazon because I’m lazy and I enjoy opening packages. Contrary to its name, anyone can qualify for the Sallie Mae card even if you don’t have any student loans. The cash back can be simply be redeemed for a statement credit. The card is administered by Barclaycards which has one of the better user interfaces I’ve seen. It is much more user-friendly than the one offered by Citibank. Be on the lookout for my full review of this card in the near future. 2. The Citi Double Cash Mastercard comes in second place and ahead of the Fidelity Amex because Mastercard is more widely accepted by merchants. There are still many places that do not accept Amex because their processing fees are higher than Visa and Mastercard. On my recent trip to the DMV, I found out they did not accept Amex! The Double Cash card is a excellent all around card that gives 2% effective cash back on everything. How they setup the reward is fairly ingenious. You get 1% back on any purchases and 1% back after you pay the balance off. This is advantageous to Citi because it encourages spenders to pay their balance to earn the full reward. One of the big areas where credit card companies lose money is when they have to write off accounts for non-payment. You have to remember that card companies make money off you even if you never carry a balance or pay interest. This is because again of the processing fees that they earn from the merchants. 3. 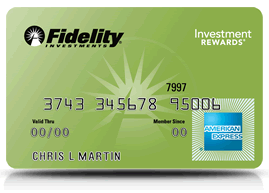 The Fidelity American Express Card comes in third place. This is another 2% cashback reward on every purchase. However, it is lower in my rankings because Amex is less accepted than Mastercard AND because it is slightly more complicated to receive your reward. You are required to have a linked Fidelity account to collect your cashback. A Fidelity Cash Management Account is similar to a online only checking account and is sufficient to meet their requirement. Because of this extra step to collect your reward, I rank it below the Citi Double Cash. With Amex Serve moving to American Express only in the future, this card should be in your portfolio for the free $30 each month. 4. 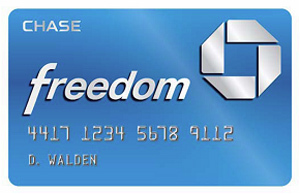 The Chase Freedom card is worth a mention at fourth place because their 5% reward categories are typically useful. For 2015, they have grocery stores, restaurants, gas stations, and Amazon.com as their quarterly rotating categories. I am not a big fan of rotating rewards because they make you sign up every quarter and you have to remember which bonus category is active. I’m sure the reason they make you activate the bonus category is because there is always a certain percentage of the population who don’t care or simply forgets to enroll and thus giving them extra profits.